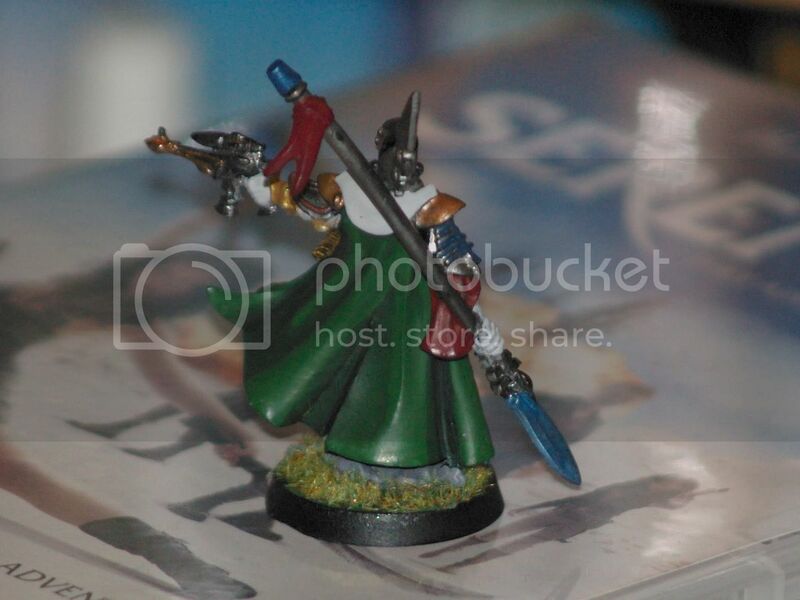 Hey everybody, I play eldar as you probably have figured and I am having a very hard time painting them and the online guides don&#39;t help at all because they don&#39;t answer my questions so I thought I would ask here. Btw I was going to be biel-tan then decided all that white would be hell to paint and am currently saim-hann and still have a horrible time painting. 2) Is the black undercoat actually going to help? 3) Let&#39;s use a warlock as an example here, I am trying to paint him Saim Hann (Yes using blood red) What is the trick to this as my friend who was painting exorcists (SM Chapter) Got blobs on their faces before the red went on well, so is there a trick or just more careful layering then him. 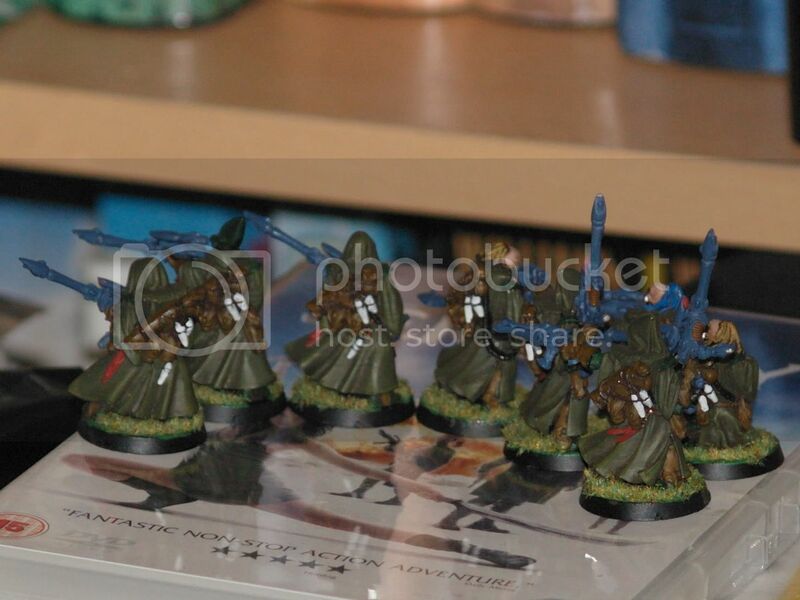 4) The shading on the robes. Is badab black wash or whatever, the &#39;tool&#39; they are using for this, I am yet to try it out though. 5) Gold, how do you guys get a clean coat of shining gold to work well on detail, i.e farseer&#39;s runes. 6) Is making a custom craftworld with easier colors to paint with a good idea or a bad idea? 8) Does the craftworld you are add any extra rules to it or just different looks because a post on this forum says it changes rules, but the codex doesn&#39;t.
I know that is a few questions but atm this is torture and as much as I love eldar they are becoming painful to play as I still don&#39;t know the trick (if any) to painting them, also any other eldar painting advice is much appreciated . 1: the problem with painting white is it is difficult to get smooth and devoid of brush marks. You want to put your base coat of white on, let it dry, then use white with a bit of water (not a &#39;wash&#39; just slightly thinner than the regular paint texture), which fills over the brush marks similar to a wash filling in the deeper areas of a figure. Let it dry, and repeat until it is nice and smooth. I wouldn&#39;t prime the helmets in black if you are going to paint them white either. When I painted my white stuff (which I no longer do because it&#39;s such a pain) I would base coat it with an extremely light grey, for the same reasons as the black basecoat (which I will get to next). 2: a black undercoat does help, because it adds depth to the figure. If all the little tiny cracks and crevasses on the miniature are darkened, it makes the upper layers stand out more. Things like armor plates stand out better when you just paint the top part, leaving the little cracks and crevices between the plates darker. 3: layerng carefully is good, as are using inks (or home-made watered down washes) that will pool up in the crevices and have a similar effect as having the black undercoat in the cracks. Careful with the pooling of the wash you use, have a napkin or something handy to dab away the places that are running, or pooling too much. I don&#39;t know which takes longer, carefully layering, or carefully dabbing away at a wash. Both are tedious, and both work to get detail to stand out. 4: No idea what &#39;they&#39; are using. When I do my blue robed Warlocks, I use the primary shade of blue mixed with a tiny bit of black, as a basecoat, then a heavy drybrush of the primary shade on the large surfaces, then a light drybrush of the primary shade with a bit of white on the edges, and finally wash the whole thing with an extremely diluted mix of the darker black-blue mix. If that makes it too dull, like if I got the wash too heavy, I keep adding water from the brush without any paint, to rinse it off until the primary color is the most prominent. I imagine the same concept would work for red, except maybe use yellow instead of white for the &#39;highlight&#39; color, unless you want to have a pinkish look to it instead of an orange-ish. 5: I actually just paint the gold right on top of a black undercoat, then highlight with a tiny bit of silver to make it more shiney. 6: That&#39;s what I do. (well, I just don&#39;t like the standard color schemes, but it is no easier to paint) I like creative paint schemes. 7: I would guess Ulthwe, because black is pretty forgiving. I would guess Biel-Tan to be the hardest due to all that white. 8) : Just a different look. I go by the book as far as rules go, and appearance discrepancies modeled on a unique figure can easily be explained away with creative reasoning (for instance, I have an Autarch that I actually play as &#39;Yriel&#39; rules, though he isn&#39;t a Yriel figure, just a customized converted autarch... Instead of the spear of twighlight, he has a cursed sword posessed by slaanesh but bound to his will, though malevolent. Instead of the eye of wrath, he has a mental power to unleash a wave of bad vibes from the sword and make an attack with its raw emotional enery that has the same effect. So long as the figure looks unique, nobody complains when I use him as a &#39;Yriel&#39; template. Thanks heaps, more info from others is still appreciated for a wider opinion, but thanks, I think I might make a custom craftworld. the altering rules was from the last edition codex. there was also a codex: craftworld eldar, that allowed different FOC than the regular codex, like the aspects as troops for biel-tan, the better guardians for ulthwe, and the ranger disruption table for ailotic. an easier way for painting stuff is to make your own craftworld. Mine has the main colours as black and scab red, which is simple, forgiving, and looks pretty damn good too. also, with dire avengers spray them white is a good idea as the helmet is done, or failing that, build up the white, starting with bleached bone and getting progressively lighter as you get closer to finishing the helmet. Not if you do White. For white paint use the white undercoat (or maybe a light grey one) otherwise the black will come right through the white paint making it loog dirty/greyinsh or force yuo to put even more coats. I learned my lesson about skull white the hard way: painted 10 guardians with white helmets and guns... It took me about one and half year and after that I couldn&#39;t stand that technique anymore. So I changed it and I&#39;m happy man again. 1. Don&#39;t use skull white, ever. Its pure evil. 3. Foundation paint with Dheneb Stone. 4. Then paint it with Bleached Bone. 5. Wash with Gryphonne Sepia. What you will get is nice natural wraithbone look (You can see example on the Storm Guardians on the main Games Workshop page.). from this it sounds like you need to do some intermediate colours! so here are a few tips i&#39;ve come across. 1, two options with white, either spray it with a white undercoat and then go over with watered down skull white afterwards (it&#39;s difficult to get 100% coverage on some mini&#39;s). Or, if you go for black undercoat(followed by watered down chaos black, remember the primers are not exactly the same colours/finish as the paints), paint it light grey or bone first, for coverage, and then mix it with white for a few layers to bring it up to a smooth pure white (i prefer a bone/white(1:3ish) mix with pure white highlights) i&#39;d suggest not painting anything directly skull white, it just doesn&#39;t look right. 2, it depends on your style, but in general the black undercoat does help, if you are prepared to work up to a pure colour you want from a colour with better coverage, it gives it a bit of depth. if you just want a flat bright colour then spray it white to start with. 4, can&#39;t really comment, i don&#39;t use washes for robes, just a dark basecoat highlighted up to the final colour in 5-10 layers. robes are my strong suit ( I love painting rangers, warlocks & farseers), and i look forward to the day that an entire robed army is released Although i have been told that the new GW inks are very good, my previous experience with the last 3 versions have pretty much put me off using inks. 5, ahh, good gold, a nice easy one! From a black base, paint it liberally with tin bitz, pick out the upper surfaces with burnished gold, just leaving some tin bitz in the recesses. Give it a highlight with shining gold, then a final, fine, highlight with silver. 7, this is very subjective, my friend likes iyanden, because it&#39;s just a white spray, yellow ink and some light drybrushing and the yellow looks very good. I prefer biel tan, as i&#39;m comfortable working with white after painting a white &#39;nid army. Then again, ulthwe are black, and black is quite forgiving. Paint to your strengths, it will make life easier! any light color needs a light undercoat... red needs red, yellow needs yellow, white needs light grey. For anything dark, where the pigment is thick, black is nice as it save you a lot of trouble. Most people I&#39;ve heard talk about the problem of painting white is that it isn&#39;t deep enough pigment to cover the layer under it. Gold type stuff just drybrushed with a very soft dusting of something silvery makes em stand out. Your figure has three stages, the under, the main, and the highlight. think of every color as &#39;base color + small amount of black&#39;, then add &#39;base color&#39; as the second stage, then tip it with &#39;base color plus a small amount of white&#39; as the third stage. This makes sense for large areas (like shoulder pads or foreheads or leg armor kind of stuff)... then you just wash black+base coat together with a lot of water, let it seep into cracks, and after that dries dust the whole thing with a TINY white drybrush that just picks out the edges, leaving the base color still prominent, just with the recesses filled and the highlights emphasized. painting white (or yellow) means doing several watered down coats, because the paint isn&#39;t thick enough for one broad swipe of a brush, like greens, blues, etc may be. If you want it shiney white, you just need to send the time bascoating it, overcoating, diluting, overcoating, diluting a lil more, overcoating... while waiting for it to dry between each bit. Finally drybrush the whole thing with absolute white juust in case your layer after layer of gradually diluted wash didn&#39;t quite smoothe it all out. Thats why I just gave my avengers blue and purple helmets, cuz after too many years of painting stuff, i&#39;m just lazy I guess. Sorry, but I&#39;m going to pick and choose as I feel the rest of them were answered pretty conclusively. 1) The trick I&#39;ve found with white - I have two armies with mainly white armour - the Fists of Flame (scroll down to near the bottom of the page and yes it does need an update) and my Sisters of Battle - is to use many, many layers of thinned down white, as many as is necessary to achieve the flat colour (even though I often stop short of it myself). I&#39;ve found it takes about 7 coats to achieve a flat colour over a white undercoat, and over black, I&#39;d imagine many more would be needed. 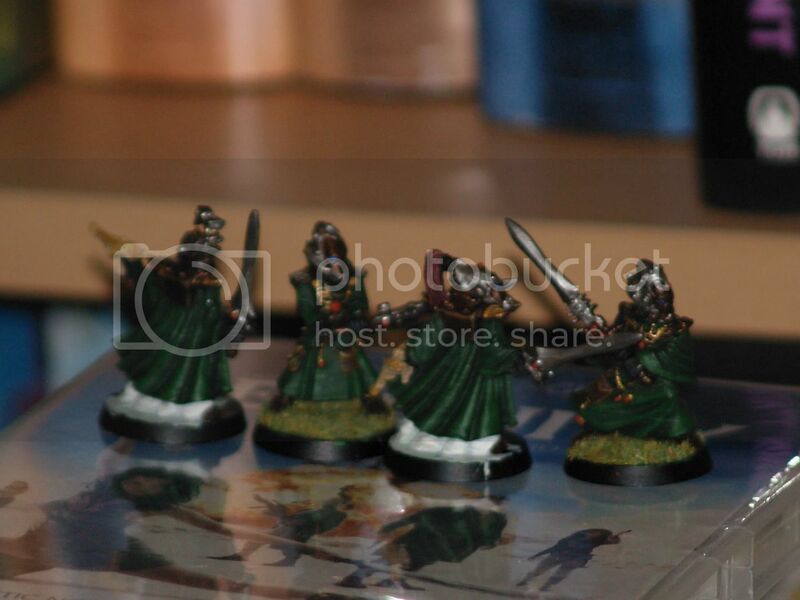 2) The black undercoat in this example is actually turned into your enemy as far as painting your army is concerned. If at all possible, undercoat the bits that are going to be white white and then undercoat the rest in black by hand afterwards. 6) I&#39;ve always found custom craftworlds etc to be more rewarding then just going with whatever GW has to offer as they allow you to personalise them in ways that the pre-made ones can&#39;t.
As an example, you could, theoretically field some custom Aspect Warriors armed with lances which in the fluff, they throw at the enemy and have them count as Dire Avengers representing their ranged throwing attacks, but that is just one idea .